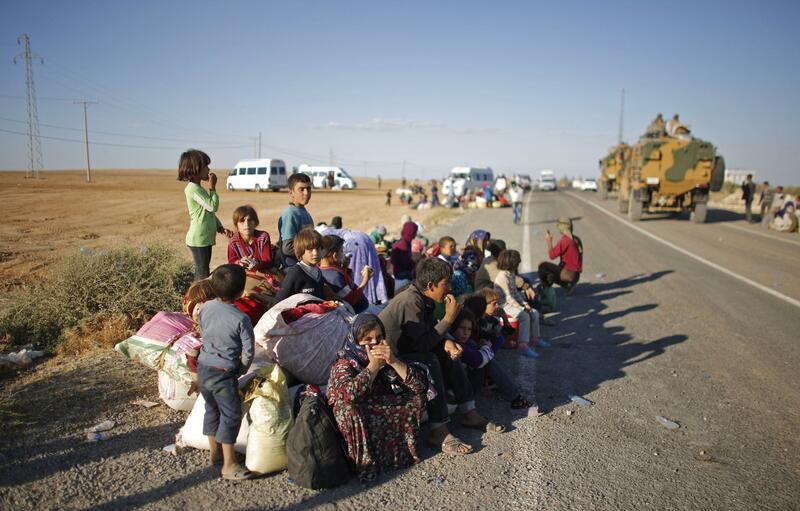 ISIS, Syrian Kurds: 100,000 refugees reported. Syrian Kurdish refugees on the Turkish side of the border. An onslaught of ISIS attacks in recent days has suddenly pushed more than 130,000 Syrian Kurdish refugees into Turkey—which has already taken in more than a million Syrians in the three years since the country began its descent into civil war. Syrian Kurds have for now been able to hold the northern city of Ayn al-Arab, which appears to be the main target of ISIS’s attack, but some villages have been abandoned because they were not feasible to defend. A United Nations official told Reuters that as many as 100,000 people may have crossed the border in a two-day period. Turkey, which is a member of NATO, appears to have welcomed all the refugees seeking safety. But it has closed at least one border crossing to Syria to prevent independence activists from Turkey’s Kurdistan Workers’ Party from joining the war. That party is considered a terrorist organization by the U.S. State Department.